Latest data in from from Realestate.co.nz, shows a rise in people from Auckland looking at properties in other parts of the country. Hawke’s Bay has attracted the greatest increase in levels of interest, with 152.2% more Aucklanders looking at properties in that region compared to last year. The data shows increases in the following areas: Manawatu/Wanganui (+123.4%), Waikato (+113.8%), Northland (+85.5%) and the Bay of Plenty(+83.5%). Offshore Asian investors appear to be showing less interest than before in the country’s property market, with 20% fewer viewers from Asian countries looking at New Zealand properties online compared to last year. However, there has been a 19.9% increase in interest from investors elsewhere in the world, particularly from Australia, the USA and the UK. 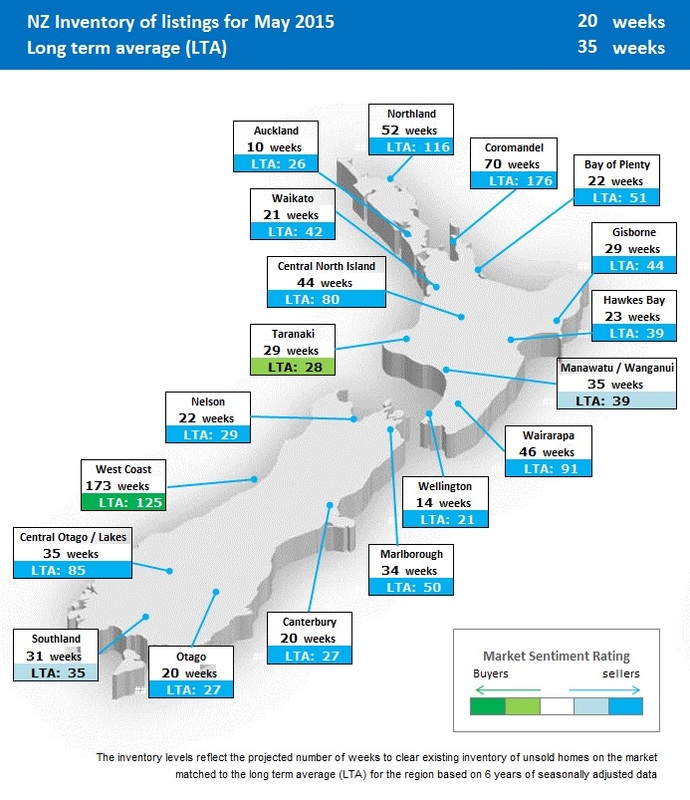 The inventory of new listings for each area: Auckland (3,769 new listings, up 2.9% compared to May 2014), Canterbury (1,319, up 1.8%), Waikato (740, up 4.4%), Taranaki (259, up 13.6%), Central North Island (182, up 52.9%) and West Coast (64, up 12.3%). The national average in overall inventory of available housing stock for sale fell to an all-time low of only 20 weeks in May. * Inventory is a measure of supply and demand that indicates how long it would take, in theory, for all the current properties on the market to be sold at the current average rate of sales.